Dental implant tooth replacement is a two phase treatment process. The initial phase of treatment is the surgical implantation of the implant post or posts. 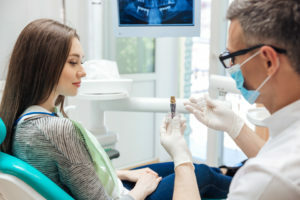 After your dental implant posts are placed, we’ll need to wait three to six months for them to fuse with the bone and soft tissue, recreating the lost tooth roots. Once the implants have fully integrated with your natural dental structures, you’ll return to have your replacement teeth designed and attached to the implant posts. Once in place, your restorations will look, feel, and function just like your natural smile. Beaumont dentist, Michael R. Olson, DDS, and his dedicated dentistry team at West End Dental Group, offer a wide range of preventive, restorative, and cosmetic dentistry services, including personalized implant supported tooth replacement plans. Whether you’ve lost a single tooth or a complete row of teeth, it’s time to schedule a consultation appointment with our Beaumont dentist and team. Call our office today. One of our caring team members will be happy to answer your questions and set up your treatment planning appointment with us. We look forward to seeing you.